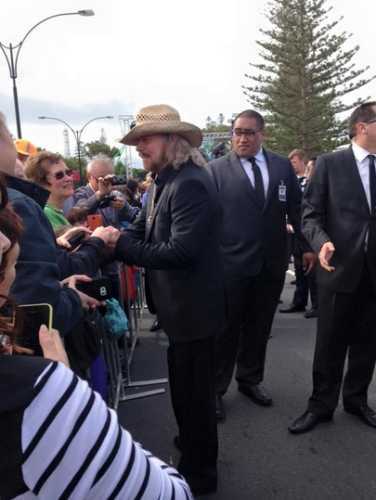 It’s the town that holds Barry Gibb’s heart north of Brisbane, and yesterday it was Bee Gees fever in Redcliffe as thousands of people flocked to see their star. The small city of Redcliffe, 30 minutes north of Brisbane, is where it all began for the Bee Gees, as it was there in the seaside suburb of Scarborough that the three brothers, Barry, Maurice and Robin Gibb, signed their very first music contract. Over the next five decades they became one of the world’s greatest performance artists and songwriters. In February 2013, Barry Gibb and Moreton Bay Regional Council unveiled a new statue and walkway called Bee Gees Way to honour the band and the most famous Redcliffe residents. But this year, Bee Gees Way underwent stage two of its development, and Barry Gibb was there to talk about his early years and meet and greet the tens of thousands of fans that gathered along Redcliffe’s beachfront. ABC reports the new display will feature a glass structure holding a replica of the original contract that the Gibb brothers signed in Oxley Avenue in Redcliffe. Earlier in the week, Barry said, “I knew what was there with stage one but this will be a surprise for me with stage two,” he said. “I’ve been giving input all along whether they were silly comments or not”. He also talked about Moreton Island, which is visible from the shore of Redcliffe. “After 57 years I went to Moreton Island, I had never been there … I would look at it in the distance,” he said. “[During the trip] I have learnt that it was a defence centre in World War II, I never knew that before. “So many things I hadn’t known, it’s such a beautiful beautiful place”. “Ultimately I didn’t want to leave Redcliffe, because my heart is where the home is, and this is where my home is,” the 69-year-old singer-songwriter said. “So there’s always going to be a big chunk of me in Redcliffe”. Take a look at some of the pics of Barry – one of Starts at 60’s writer’s friends got to meet him! How great does he look?